Accra, May 4, GNA - Accra Hearts of Oak, CAF Champions League campaigners seem to be having it tough in their preparations towards their first leg match against Etoile du' Sahel of Tunisia after losing two friendly matches in a week. Hearts after falling to Kumasi King Faisal last Sunday by 3-2 were again beaten by Obuasi AshantiGold 2-0 in another friendly match played at the Accra Sports Stadium on Wednesday. 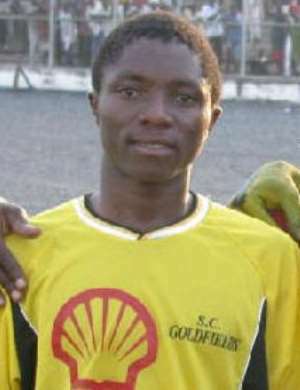 Goldfields played with a combination of youthful and experienced players made up Shaibu Yakubu, Lamine Nasir, Owusu Sekyere and skipper Kofi Amoako whilst Hearts rested the likes of Louis Agyeman, Osei Kuffour, Don Bortey, Lawrence Adjei, Dan Quaye and Kwabena Boafo. The Miners were the dominant side right from the blast of the referees whistle but could not utilise any of the chances that came their way. Despite their dominance of the game it was the homesters who attempted to open the scores in the 43rd minute when Ablade Morgan received a through pass from Wisdom Abbey but he surprisingly shot over the bar to end the half goalless. On resumption of the second half, the visitors maintained their pressure on Hearts and scored the first goal through Valentine Atem in the 52nd minute after Sammy Adjei had failed to make a first time save. Hearts responded quickly and made some attempts at goal but which never materialised and Miners rather benefited as for the second time, Atem was on hand to make it two for his side in the 63rd minute after Alfred Arthur had laid splitted the Hearts defence. Hearts dreams of levelling up were thwarted when two of their hard working midfielders Francis Bossman and Adjah Tetteh were sent off in the last ten minutes of the game for receiving two yellow cards for fouling their opponents which attracted the referees red cards.